Chances are that the printer in question is differently configured compared to other printers of the same type. Check the protocol settings in the port configuration on the printer server first! 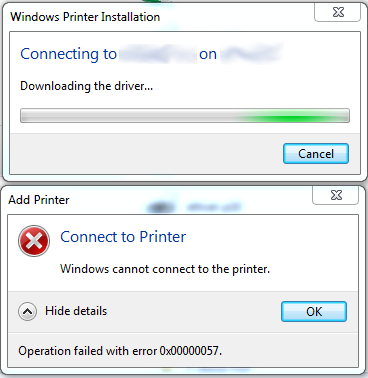 Then, as the user who got this error message, remove all installed printers of the same manufacturer. Some files might be reported to be in use in Explorer. Simply restart, then try deleting these files again. Next, start regedit and navigate to “HKLM\System\CurrentControlSet\Control\Print\Environments\Windows x64\Drivers\Version 3”. If there are keys/subkeys and other entries of the manufacturer whose drivers you have to get rid off, delete them. This will put a file called drivers.txt in C: listing all installed .inf files. The files is easier to search than the console output. Look for the manufacturer as listed by “Driver package provider”. Each entry lists the the name of the .inf file was used to install the drivers. Deleting the drivers from the repository is simple: pnputil -f -d <name_of_the_inf_file>.inf which will remove the inf file from the repository and the associated drivers. Reboot and delete any remaining drivers from the spool\drivers folder. You are currently browsing the Musings From Beyond blog archives for October, 2014.